Welcome to the haunted hovels section of haunted places in Washington. Please select a link below to view information on that location. The History of Washington includes thousands of years of Native American history before Europeans and Americans arrived and began to establish territorial claims. The region was part of Oregon Territory from 1848 to 1853, after which it was separated from Oregon and established as Washington Territory. In 1889, Washington became the 42nd state of the United States. Again, as with all other states, many battles took place here, the area, as always holds potential for the presence of ghosts. This Building has two floors, the first floor has the restaurant, the second floor used to contain a brothel and some of the ladies and a very infamous ghost named Billy Ghol may haunt the place. lights go on and off at night, cold spots and fog on the plate glass mirror has been reported. A man doing maintenance on the auditorium roof fell through and broke his neck and died. A cheerleader is also said to have died and they both can be seen at night walking on the top floor of the school. The Maintenance worker can also be seen in the auditorium. There is also said to be a "lost room" underneath the high school. It is probably just a bomb shelter. Many of the employees of the Fred Meyer in Auburn, WA, have experienced strange activities. They have heard boxes being thrown around while one employee was in the Apparel stock room, but no one else was there, and no mess was left behind. The stock room is connected to the shoe department, where people, employees and customers frequently have shoes thrown at them. While no one has seen an apparition, some events are too weird to be coincidental. 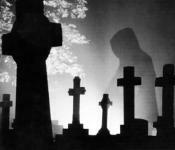 There have been reports of a ghostly apparition floating along the stone walls of the cemetery. Inside the walls there are 3 hot spots and a monument called the "death bed", it is said that when one lies upon this monument they expedite their death. The other "haunted" monument is called "angel eyes", it is believed that the apparition that is seen wandering the stone enclosure is the spirit of the person buried beneath that statue. Maryhill Museum is a reproduction Italian villa, after the villa became a state museum, curators reported odd noises at night. Many of the local volunteers docents and cleaners also report noises and chills throughout the four-story, century-old building. Witnesses report quite a few things happening in that grave yard, a list of peoples experiences have been reported below. 1. strong pains almost every time they enter. 2. hearing footsteps behind them and/or around them. 3. seeing figures in corners of their eyes and just when they are plain staring at something. 4. hearing whispers in their ears. 5. seeing a woman in a white dress numerous times, also the apparition of a boy has been spotted. A contorted face of a man can be seen in the grain of the wood on door 203. Reportedly a young man committed suicide in the room in the 1960's. Strange cold spots, odors, and senses of panic have also been noticed on this floor. The spirit of a woman is often seen pacing along the sides of the alleys when it's not too crowded. Workers there have become accustomed to her. Make it known that if you are going to this hotel, and you go upstairs be prepared, you will see a little girl about 4, with red hair and blue jean shorts with a pink shirt on! She might try to push you down the stairs (Do Not Be Alarmed!) but it does not work. All you can feel is a sort of tingle go through your body. You can hear a little girls voice saying "The bad woman’s gonna hurt me!" Also you might hear "Turn around, the bad woman will hurt you!" People say that her mother beat her to death. At dusk shadows of people dressed in white appear on North hill. Also on top of generals row a man dressed in army apparel has been seen wandering around soldiers graves. On the west side a dark figure has been seen wandering outside the orchards. The building, before its renovation, was built at the turn of the century. Witnesses claim to have seen a glowing figure of a man floating down the isle inside the theater. The apparition was shadowy with sort of a glowing aura surrounding him. Barto Hall is haunted on the top floor in the room now known as C-37, a young man haunts the room and people that have lived there in the past have heard strange noises and seen apparitions of him standing in the door way to the bedroom. people say they have heard sounds and screaming in the theater only at night and the bathroom doors opening and closing on their own. This Old homestead was the first homestead in Kittitas valley and was once used as an Indian fort and is now a state park, People have reported the feeling of being watched there and sightings of Indians have been reported along the creek, others have reported hearing a woman screaming and a baby crying during the full moon! The Rucker mansion is haunted by Mrs. Rucker, who committed suicide by jumping from the bedroom window on the top floor. Sometimes she can be heard playing the grand piano when no one is in the room. At night sightings of ghost apparitions are seen in the woods on North Fort Lewis and a few people say they have seen mysterious cloaked spirits along with spirits of Native Americans. There is an old legend which describes a tale regarding a young woman and her son traveling the narrow road on Cherry Hill when she lost control of her car and ventured over the side of the steep cliff. Her face is reportedly seen engraved in the bark of tree trunks along the Yakima River which flows adjacently below Cherry Hill. In 1889 the Bush House was built. It was built for miners who where moving to Index. At the turn of the century there was a young woman named Annabel that came to Index to wed. Her future husband worked in the mines. There was an explosion and word got down the valley to Annabel that her husband to be had been killed in the explosion. After getting word of this she hung herself. Turned out that her future husband had not been killed and went to get Annabel and found that she was dead. Rumor is that he then killed himself. Annabel’s ghost still haunts The Bush House today. Along with some other people that have died there. She hung herself in room 9 and her apparition is a common sighting. Since then many residents of east hill elementary, have seen the ghost walk across the campus and disappear before their very eyes.But many more have felt the ghost try to strangle them, starting with...... Me. This is the building that Stephen King filmed the movie Rose Red, but other real life things have been found there. Orbs and Ectoplasm are the most that they have found so far. The Lighthouse Resort then known as The Lighthouse Motel was built in the 1950's. The older "ridge" cabins are haunted. Guests write in journals that are in the rooms and there are entries of TV's turning on and off. Rocking chairs rocking for ten minutes or more for no reason. Doors opening and closing with no explanation. Waking up and finding the living room furniture re arranged and moved. The words, "I can't breath" & "burn" have been whispered in a visitors ear while in bed. It is a creepy feeling by just looking at it. It is said that you can heard kids walking, screaming, and running down the stairs. You hear pans from the kitchen banging and shutters opening and closing on their own. The school was just shut down due to it being unsafe, it is now all boarded up and graffiti covered. When you're in the theatre alone, you can hear things scratching from the inside of the walls. Backstage during school performances, actors have heard strange mumblings in there ears. There is a rumor that a girl was killed on stage during a performance after being pushed off a large set piece. She now haunts the theatre with no intention of ever leaving. Its an old library that was once the towns first post office. Strange noises are heard from the attic as well as boxes being moved to different locations. Also there have been reports of children being heard through the ceiling coming from the attic. The playhouse is supposedly haunted by one of the people who built the playhouse. It is said that you will see a black cat walking across the stage or a dark figure in the window of the control room. This house was built a long time ago back when the small town was just starting off. A family had just moved in the place and everything was calm for a little bit. After a few months weird noises could be heard followed shortly by an apparition that looked like an older women. Things would be moved around at night making you feel like you were never alone. The legend says that an older women died in the house so maybe that is who still walk's the place. Toilets flush when no one is there, lockers slam at night and pencils fly across empty rooms; according to numerous reports, walking into the guys locker room, you can feel someone grabbing your neck and hear them yelling 'Get away from me! Mysterious sounds, slamming doors, and strange old man sightings haunt this Korean Baptist church. This was a former Masonic church which was once used to sacrifice animals and supposedly humans. Visit this building alone and you'll experience first hand of the level of demonic hauntings here. In 1926 the body of 22 yr old Sylvia Gaines was found murdered at Greenlake, it was determined that her father had killed her in a drunken rage, witness's at the trial stated that they had been having an affair and Sylvia wanted to leave, the point of land where her body was found is named Gaines Point and there have been reported sightings at night of her ghostly figure wandering the point. This is now a movie theater but used to be a meeting hall for a women's organization. People have reported seeing the ghost of a hanging woman in the hallway, as well has hearing footsteps and laughter. Apparently, a long time ago someone was raped in one of the halls in this school. Some people have heard odd noises and there is a place in one of the halls where people have walked right through it and a rush of fear came over their whole body. There has been reports of a dark shadowy figure with no eyes. Lights being shut off and on. Sounds of running water when no one is in the building. Rite Aid used to be a mining place in west Seattle and it is rumored it has a spirit that will turn off lights, set off alarms, and even call employees and hang up. Many unexplained occurrences go on here all the time. From footsteps and glasses moving in full view of the guests in the Hunt Club Bar. Guests report sightings of a woman on the 4th floor near the room 408. It's the home of the blue lady. The story goes that on the very top floor of this place it use to be a speak easy, where the lady's of the night entertained and where gambling went on. One of the prostitutes had a new boyfriend. The boyfriend walked in on her as she was doing business with a "John". He was so enraged. Forgetting what her line of business was he killed her. Children that have drowned in the lake are said to be heard playing in the play ground above the park at nighttime when the park is closed. Also a fisherman reported seeing the pale corpse of a girl who drowned and was never found, it is said to be seen floating 4 feet under water on the south side of the lake in the early morning. Security guards there have reported elevators moving on their own accord, lights being turned off and on, and doors that were locked being checked and found unlocked. There is a spooky vibe there, and several guards have quit rather than work at that location. There is a lake in the woods that is located behind pierce college on the way to the old Western state sanitarium. At night early morning hours you feel a presence, see hazy apparitions and hear voices around the lake. They belonged to a woman that drowned there many years ago. Reports of cold spots, sounds of people and the cold sense of a presence. The blood on the wall reading JOE... a hand print, and the long dried blood that almost seemed to be dripping. At Fort Vancouver, the ghost of Dr. John McGloughlin still haunts his old house, they say you can hear his heavy foot steps walk up and down the halls. Some say there are people in the look out tower that can be seen from the ground. A husband came back from vacation to find his wife cheating on him. The husband killed the other man on the stairs, and it is reported that you can hear someone walking up and down the stairs when no one is there. There are also blood stains on the stairs that when washed disappear for a few moments and then re-appear. The following story was submitted by Ethan and remains un-alterered:My friends and I were walking on the peninsula of ocean shores on vacation. as we were walking we saw a gravel road, so we followed it. as we followed it, it slowly began to become the grass around it. as we reached the end we look down and see a human muzzle. the kind they use on mentally insane people to keep them from biting. it had the name Shawn written on it and an ID number. as we walked farther we saw a flock of geese on the ground and heard a loud, deep barking sound, the geese took off but no dog. we looked and there were BIG footprints of where the dog supposedly was. and when it started to get dark we saw footprints of fancy dress shoes of some sort dug into the ground as if they were running and then it looked like there was a struggle there. on a tree a bit off to the right there is a set of bare foot prints as if somone was trying to climb up a tree because they stopped at the tree. my friend picked up a rock and said if there is anything there then knock the rock out of my hand. nothing happened and then he yelled "COME AND GET ME!!!" out of nowhere there was a loud blood curdling scream as we ran to where the sound was there was nothing there. to this day we still try and figure out what is going on in that eerie cold place. Witnesses have reported a woman looking out of one of the back windows of the commanders house. she is thought to be the wife of the commander who died of fever in the 1800s. The fort may be the source of the Toppenish ghost lights seen in the area in 1973. There has been many reports of people seeing and hearing things in the theatre. A lot of the time things happen at night during clean-up after a show. It has been said that there is only one ghost that they know of and he loves the theatre. He doesn't bother or hurt anyone but loves to give people a little spook. It has been reported more than 100 times at night in cherry park that you can see children running around in circles screaming at the top of there lungs. This goes on for a good half an hour, while you smell a strong scent of sulfur in the air.